In recent years I have paid little attention to the plantation sector, despite its importance to several Southeast Asian economies and to the global food supply. The rapid expansion of the sector has caused justifiable concern on deforestation (we now have very little rainforest left), land acquisition (what happens to the former owners), the biodiversity lost to the monoculture (what happens to the orangutans and other wildlife), and the direct environmental damage (from fertilisers, pesticides, and peat burning). The industry is now often vilified, but it will not be intentionally downsized - and since it is now by far the world's largest source of edible oil, and yields far more oil per hectare than any other crop, we must hope that biological threats never prove serious. Apollo Asia Fund has no investments in plantations at present, but if I were considering them, or running a large global fund that had to invest in the sector, I would wish to be environmentally discriminating, and this is how I would begin to screen the companies. - check the list here. Probably most listed companies are members, but Astra Agro Lestari is one striking exception. - supposedly mandatory, but Genting Plantations and Tradewind Plantations are among those that have not. - Boustead Plantations has only 4 of its 50 estates certified. QL Resources provides none of the statistics requested and says its reasons for non-disclosure are confidential. While scheduled to achieve 100% RSPO certification of its estates in 2015, it says it has no plans for action to achieve this. - complaints, responses, and the status of investigations are publicly posted. Equatorial Palm Oil is a joint venture partner and 20% associate of Kuala Lumpur Kepong. - our list of recommended disclosures is below. - especially on land acquisition and development, any labour and community grievances, responses to climate change and to other challenges. - additional criteria may be appropriate. There seems to be a trend towards relying on certification by third parties, which is understandable for customers and investors wishing to find simple solutions to complex issues, but has some dangers. The scope of certification is often much more limited than most readers realise. Some companies use RSPO and other organisations quite cynically, to satisfy many questioners while deflecting attention from core issues. Golden Agri-Resources for example publicizes sustainability efforts which are focused on its existing pre-2010 estates, and diverts attention from the key issues relating to its expansion and deforestation. It aims to get two minor end-products RSPO-certified, while not disclosing its usage of non-certified CPO and palm kernel. Its ACOP is riddled with non-disclosures that make one wonder about the company's commitment to the move towards sustainability. a push for increased public disclosure. - on a consistent basis, updated annually, tabulated with comparative data for prior years. SVLK certifies operations which may source illegally and/or unsustainably produced timber from other companies. Independent monitoring of the SVLK process has not been effective. - and concludes that the system is ineffective in excluding timber related to corrupt practices, natural forest clearance harming indigenous communities and critically endangered species, peatland drainage and burning; and that certified processed products like pulp or paper may have been sourced from any type of illegal and/or unsustainable operation. WWF's punchy press release is here; the full report is entitled SVLK flawed: an independent evaluation of Indonesia's timber legality certification system'. To save readers from overlooking data reported in different places, information from the RSPO ACOP should be added, including the number of strategic operating units certified, the number yet to be certified, and the date by which this is to be achieved. The most helpful graphic display of the age profile for a plantation group, and for each strategic operating unit of estates and mills, is the format shown on the right. 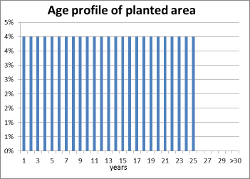 Shown here is an ideal steady-state plantation with a 25-year replanting cycle. 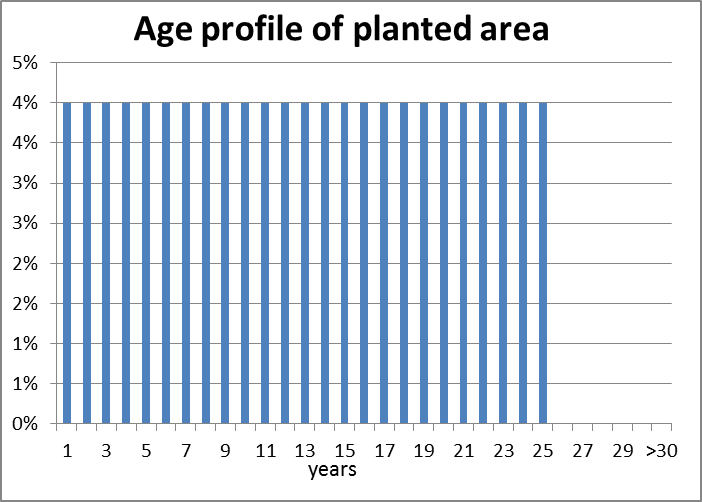 If there are years for which the percentage is significantly higher than 4%, the implications for bunched replanting requirements and mill throughput variation are apparent at a glance.